Have you ever wanted to see a Cairne Bloodhoof hit Sindragosa in the face with a totem? What about Baine Bloodhoof flattening a Kirin Tor Mage? This Hearthstone card reveal from stupendous animator AmazingLP proves why only Sylvanas would dare take on a Bloodhoof — and debuts a sneaky new Kobold coming in the Rise of Shadows expansion. This isn’t the first time AmazingLP has gotten to do a card reveal for Hearthstone. He’s shown off Luna’s Pocket Galaxy for the Boomsday Project expansion with a sassy Anduin being demolished by Jaina. Followed up with Thralls most embarrassing defeat since that time he took on Garrosh at the end of Siege of Orgrimmar. Which just goes to show you — don’t mess with Zul’jin when cards are on the line. From the first shot of this latest video you can tell that AmazingLP has stepped up his game. No longer confined to the Tavern, Jaina and Valeera face off across a wide-open courtyard. Everything has been scaled up to be truer to the size you w0uld expect of dragons, Tauren, and Nerubians. Sindragosa positively towers above Jaina and makes even the mighty Bloodhoof look small. The effects have been scaled up too, with the Kirin Tor mage throwing a torrent of Arcane bolts at Baine to no avail. We even get more English translations of the cards as they’re being cast, making it even easier to follow along with the action. Of course, the crowning moment is Valeera walking away from the massive explosion where Jaina used to be standing. From Warcraft to Hearthstone, Rogues love a good combo — and this one could be a doozy. 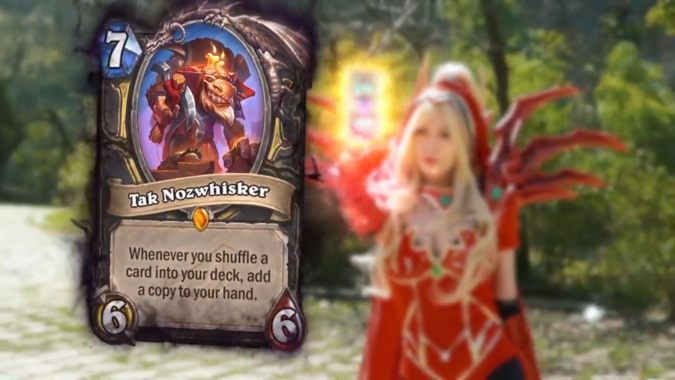 Tak Nozwhisker is a brand new legendary minion with a wicked ability to double up on cards you’re sneaking into your deck. If you’d like to copy Valeera’s combo from the video, you’ll need Tak, Preparation, and a little Academic Espionage. It’ll be random what cards you get from your opponent, but you should be able to get a great turn out of it. Especially with only spending one mana on the Espionage, you’ll have all that surplus mana to wreak havoc on your foe. If a little espionage isn’t up your alley, this deck features Tak and a whole heaping pile of Pogo-Hoppers. Just imagine how big those bouncing bunnies would get by the end of the game! Each of these videos has gotten more and more impressive. I can’t wait to see what card AmazingLP gets to reveal next! I do hope that it’s something great for defeating Priests. It’d be nice to see that smarmy Anduin get put in his place again.